This AONB is split into many small fragments. It contains some of Britain's finest coastal scenery, including Land's End and the Lizard peninsula. In addition Cornwall's highest moorland around Bodmin is also included in this very varied and historically interesting area. The north coast includes the famous headlands of Tintagel and St Agnes Head, extensive sand dunes, and the spectacular cliffs north of Boscastle, which rank amongst the highest in Britain. In contrast the south coast has a softer feel with a landscape of cliffs, coves and fishing villages. The ria coastline with its flooded valleys is typified by the estuaries of the Fal, Fowey and Helford Rivers with their extensive oak woodlands. The Fal River in particular is one of Europe's best unspoilt examples of a drowned estuary complex. The Lizard and Land's End are two of the most dramatic headlands in the UK and each has its own distinctive geology. The serpentine of the Lizard is world famous and is found in the reefs and stacks of this wild section of coast. Further west the granite around Land's End has stood the test of Atlantic storms and is rich in minerals which have been mined for centuries. The Cornwall AONB also includes the Camel Estuary (25 sq km) and considerable areas of inland landscape. These include Bodmin Moor, the heaths inland from the Lizard Peninsula and the moors of Penwith with their fascinating history. Bodmin Moor shares many characteristics with Dartmoor and is dominated by granite outcrops with characteristic granite tors and their associated clitter slopes. Man has had an effect on the landscape and the traditional farmed landscape of small hedged and banked fields is an intrinsic feature of the AONB. 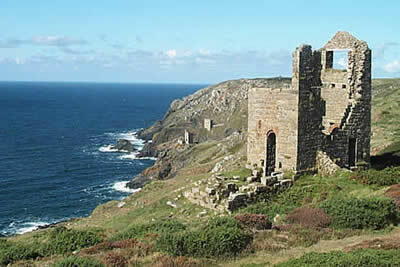 In addition there are ancient standing stones, the distinctive ruins of Cornwall's tin mines and a host of other features that are unique to this varied landscape. There are few large settlements although St Keverne, Mevagissey, St Just and Polperro are all bustling holiday centres. The opportunities for walkers are endless. The South West Coast Path, a National Trail, follows the coastline and in paces offers some demanding walks as the path undulates along the cliffs. The moors of Penwith and Bodmin are often neglected by walkers yet they provide a scenically interesting walks with industrial heritage not far away. Elsewhere within the AONB there is something to suit every taste with an abundance of short walks that offer a taste of this beautiful part of Britain.